1. Evaluate why CS styles are used. 14. 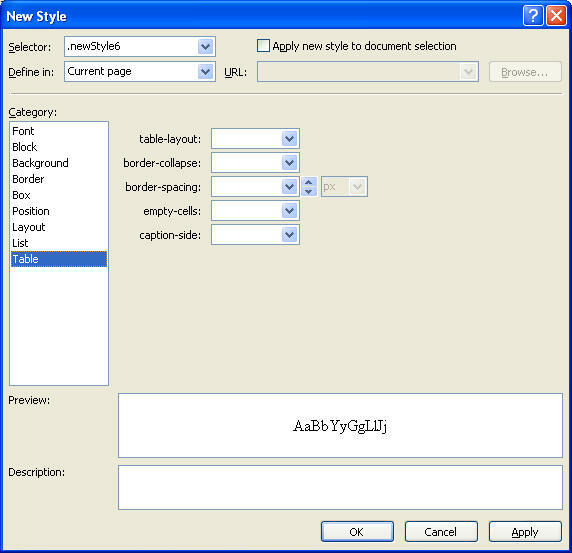 Move styles within an internal style sheet. 15. Move styles between style sheets. 1. CSS -cascading style sheet. will control the appearance of one or more of your web pages. Provides greater consistency, Easily modified code and greater functionality. 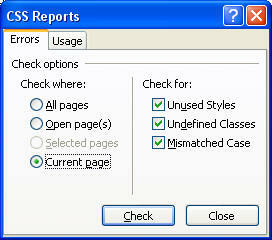 Cascading refers to the weighting, or prioritizing, of potential style conflicts. a. Style is a formatting attribute or groupof attributes applied to single character, a word, a section, or an intire web site. b. CSS style is a collection of one or more rules that declare how a XHTML selector will appear. 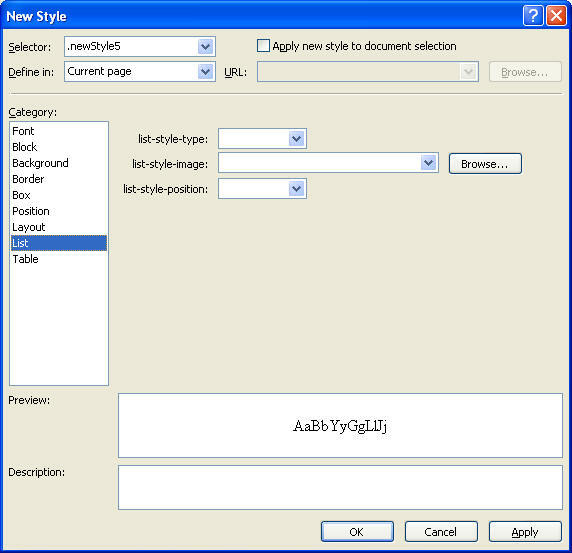 c. Style sheet is a collection of styles rules that are applied to specific elements. 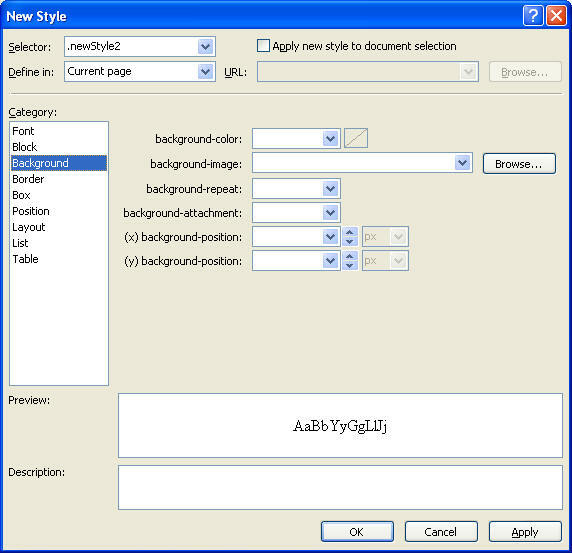 d. Selector identifies the element or group of elements to which the style is applied. 1. Element selectors are used to format a single XHTML element. 2. Class selectors are used for format multiple XHTML elements. 3. ID selectors are used to uniquely format a single instance of an XHTML element. 4. Property describes how the selector will be changed. 5. Value indicates the manner or the extent to which the property will be changed- words, numbers or percentage. a. Start brace before the declaration list. d. an end brace at the end of the declaration list. 3. External style sheet- separate file that contain only css code. Can be applied to mutiple pages or sites. a. no XHTML code ar any other typed characters or spaces are contained in the CSS external. c. link tag - used to link a css style sheet to an XHTML file. Contain in the head section of the XHTML file. 4. Internal style - write the CSS code in the <head> section of XHTML document. Also called embedded style. 5. Inline Style-style that is written a tag in the <body> section. b. A style rules syntax has three parts: a selector(the element to which the rule applies, Such a H1), a property (how the lement will be changed), a value (the specific change or degree of change). c. Declaration is made up of the first part of a style the selector, then the property, then the value. 6. Apply Styles task pane icons. 7. Specificity - determines priorities and uses a weighting method to calculate which style rule will prevail when there is conflict. a. an inline style will prevail over both an internal and an external style. b. if conflict in style sheet the style farthest down the list will prevail. 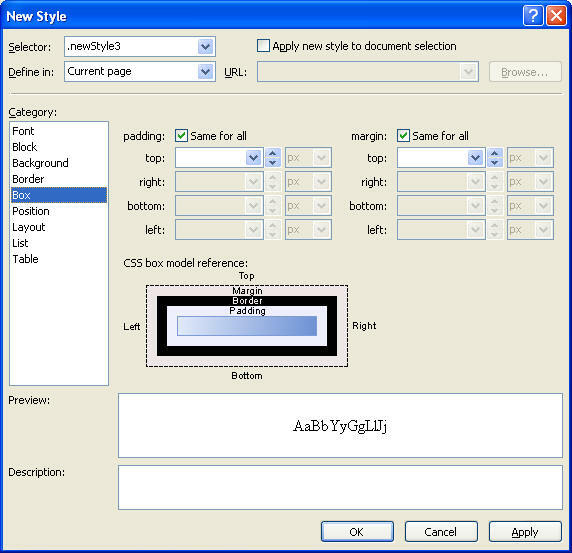 c. Id selectors dominate have a rating of 100.
font-weight bold, normal Makes text appear bold or not The key word values lighter and bolder and the numeric values (100 to 900) are generally not supported. line-through, blink, none Generally used to underline text or not. Use underline only with links or together with overline to style headings. Do not use blink. Line through is seldom used. 12. Font family property is used to identify the font that is currently in use. a. click font family list arrow. 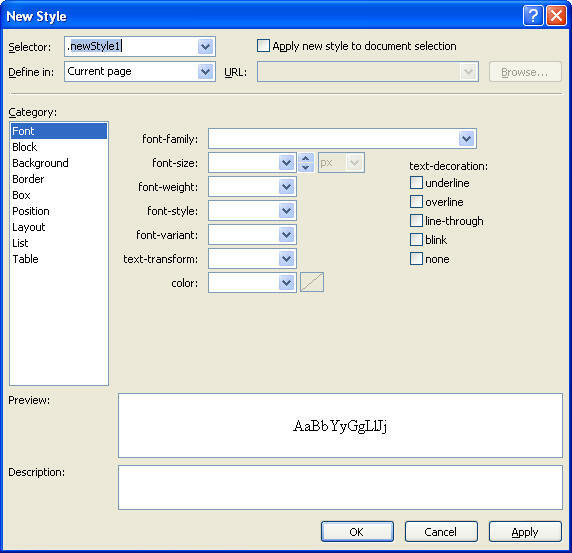 c. after the font name type a comma, press spacebar, type in font name. 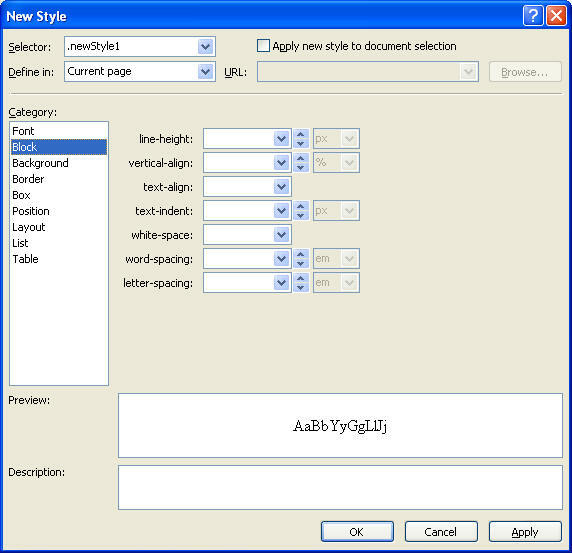 d. font size is used to change the size of text- select the size you want. e. font weight to make text bold. f. font style can make text appear italitics or not. g. font-variant is to display text in small caps. h. text-transform -capitalize (first letter of each word), lowercase (text all lower case), none (removes any values) and uppercase (text in all uppercase). i. Color - determines the foreground (text colors) color. j. Text decoration - underline, overline, line-through, blink, and none. 14. Class selectors:-allow you to define your own XHTML elements and define the appearance of an element in more than one way. b. independent classes style any XHTML element. You will note that the modify style dialog box is identical to the new style with font, block, background, border, box, position, layout, list, and table categories that can be modified. 18. Remove formatting in the document: Click anywhere inside the text that you want to remove the formatting. Click format on menu bar, click Remove Formatting. 19. To clear a style: click the style tag of the paragraph to select the tag and the tag contents. 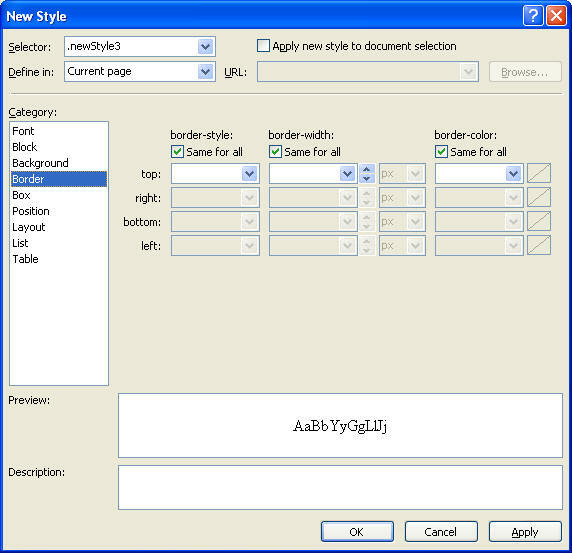 Click the apply styles tab to display the apply styles task pane. In the apply style task pane click clear styles. a, Make sure that an inline element (<em>, <strong> or <span> is in the block of text that you want the inline style. b. Select the text for example: <span>Home Page</span>. The span code can be inserted in the code window. 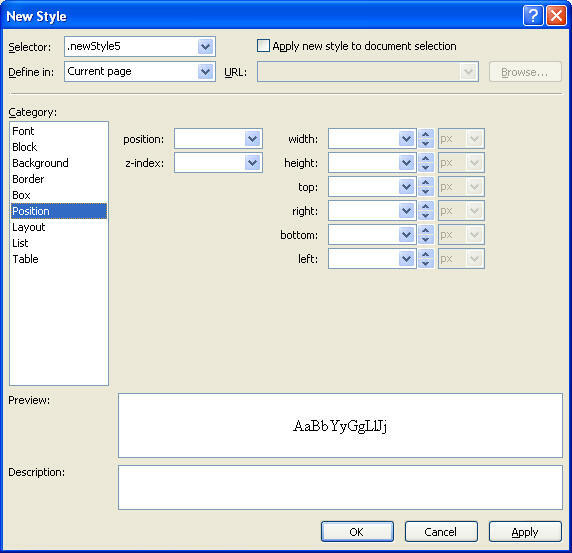 d. Select manual from style application list arrow. e. Select new inline style from the target rule. 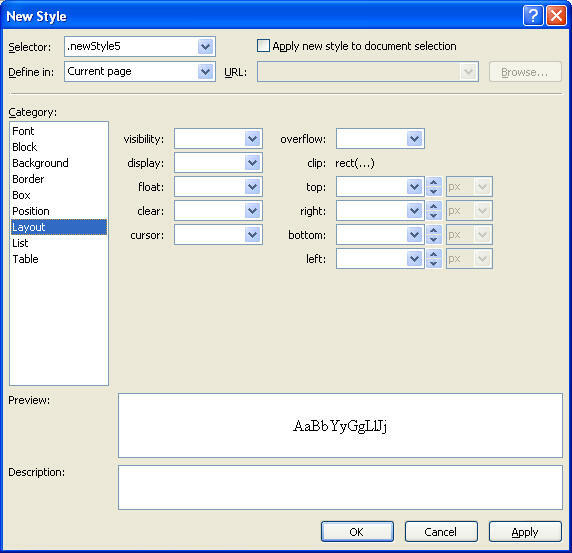 f. Select target rule list arrow again click apply new style, the new style dialog box opens. g. Click the selector list arrow and click inline style. h. set the properties that you want for you inline style. a. Click file on menu bar, click new, click CSS. c. Save the file and give it a new name. 22. Attach CSS to web page. a. Open the page that you want to apply CSS to in design view. b. From the folder list drag and drop the CSS page onto the web page in design view. 23. Run a CSS repot. b. Select all pages, open pages or current page. c. Click the check button and view the report.